So it was a mystery as to why astronomers had not been able to nab one of these stars in pre-explosion images. Finally, in 2017, astronomers got lucky. A nearby star ended its life as a type Ic supernova. Two teams of astronomers pored through the archive of Hubble images to uncover the presumed precursor star in pre-explosion photos taken in 2007. The supernova, catalogued as SN 2017ein, appeared near the center of the nearby spiral galaxy NGC 3938, located roughly 65 million light-years away. This discovery could yield important insights into stellar evolution, including how the masses of stars are distributed when they are born in batches. "Finding a bona fide progenitor of a supernova Ic is a big prize of progenitor searching," said Schuyler Van Dyk of the California Institute of Technology (Caltech) in Pasadena, lead researcher of one of the teams. "We now have for the first time a clearly detected candidate object." His team's paper was published in June in The Astrophysical Journal. A second team led by Charles Kilpatrick of the University of California, Santa Cruz, also observed the supernova in June 2017 in infrared images, which were captured using Keck Observatory's powerful adaptive optics system combined with its OH-Suppressing Infrared Imaging Spectrograph (OSIRIS). Kilpatrick's team then analyzed the same archival Hubble photos as Van Dyk's team to uncover the possible source. An analysis of the object's colors shows that it is blue and extremely hot. "This supernova occurred in a crowded part of its host galaxy. When we looked at a pre-explosion Hubble Space Telescope image, the stars appeared closely packed together," said Kilpatrick. "This discovery was only made possible because we were able to use Keck Observatory to pinpoint the location of the supernova in its host galaxy. The extremely high-resolution image from Keck allowed us to determine with a high degree of precision exactly where the explosion occurred. This location happened to land right on top of a single, very blue, and luminous object in the pre-explosion Hubble image." The results from Kilpatrick's team, which appeared in the Oct. 21, 2018, issue of the Monthly Notices of the Royal Astronomical Society, is consistent with the earlier team's conclusions. 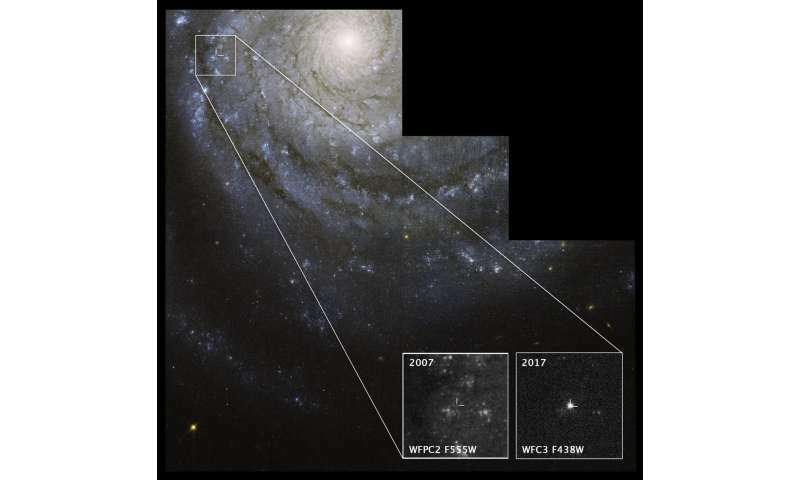 "We were fortunate that the supernova was nearby and very bright, about 5 to 10 times brighter than other type Ic supernovas, which may have made the progenitor easier to find," said Kilpatrick. "Astronomers have observed many type Ic supernovas, but they are all too far away for Hubble to resolve. You need one of these massive, bright stars in a nearby galaxy to go off. It looks like most type Ic supernovas are less massive and therefore less bright, and that's the reason we haven't been able to find them." Because the object is blue and exceptionally hot, both teams suggest two possibilities for the source's identity. The progenitor could be a single hefty star between 45 and 55 times more massive than our Sun. Another idea is that it could have been a massive binary-star system in which one of the stars weighs between 60 and 80 solar masses and the other roughly 48 suns. In this latter scenario, the stars are orbiting closely and interact with each other. The more massive star is stripped of its hydrogen and helium layers by the close companion, and eventually explodes as a supernova. 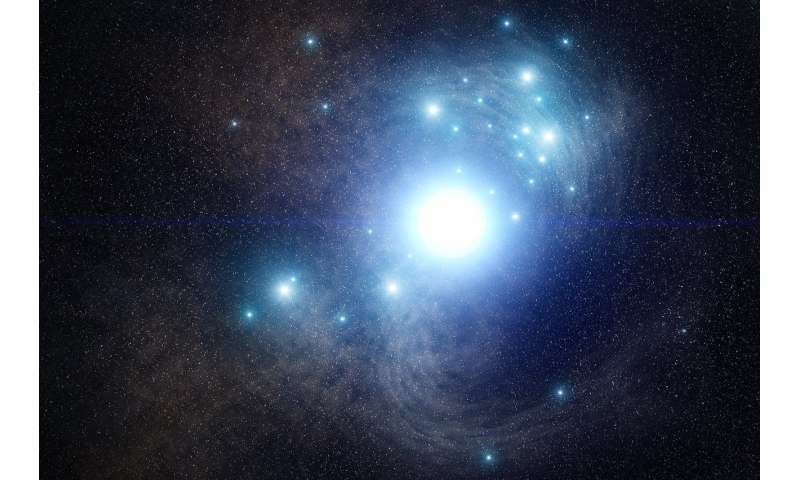 When they didn't find the progenitors stars, which should have been extremely massive and bright, they suggested a second method to produce the exploding stars that involves a pair of close-orbiting, lower-mass binary stars. In this scenario, the heftier star is stripped of its hydrogen and helium by its companion. But the "stripped" star is still massive enough to eventually explode as a type Ic supernova. The very massive stars appear not as individual formations but as the very cramped nurseries of a new born normal stars.